And now I get to review my favorite book of the Summer! The Long Awakening, by Lindsey O’Connor, is so, so good. I saw my friend Lael Arrington post about this book on Facebook earlier this year. I read the synopsis and then decided that, though I wanted to read it, I’d save it for after the birth of my third child. If you’re the type who can imagine herself into a state of paranoid worry (like me), I’d recommend any other pregnant women do the same! But a few weeks after the birth of my third child, I picked up The Long Awakening and drank in this beautifully written book. The memoir tells O’Connor’s experience of near death and recovery from a 47-day coma immediately after her fifth child’s birth. O’Connor’s descriptions are entrancing. She has the ability to bring you into a hospital room with her, and then right into her head as she describes what coming out of a coma is really like. The narration isn’t chronological, but the back and forth nature of it is perfect for really relating to the story. The reader learns what happened during three different time periods that are like different lifetimes to O’Connor: before the coma, during the coma, and after the coma. Somehow she manages to jump back and forth while creating a complete and easy to follow timeline, filling in gaps here and there. The effect is that the reader better understands what her recovery was like–a lot of gaps that needed to be filled in for her to feel fully conscious and alive. Beyond the writing, I was fascinated by how O’Connor, a woman of strong faith, wrestles with the darkness of her experience. This is not your typical “Heaven is for Real” or “90 Minutes in Heaven” story. There was no flash of light and warm cocoon sensation for O’Connor. As O’Connor recovers and wrestles with her experience of near death as a Christian, I appreciated her stark honesty and her realizations that came in their own time. Definitely check out The Long Awakening next time you’re looking for a riveting, exquisite, and thought provoking read. See what else I read this Summer, or find my list of favorites. 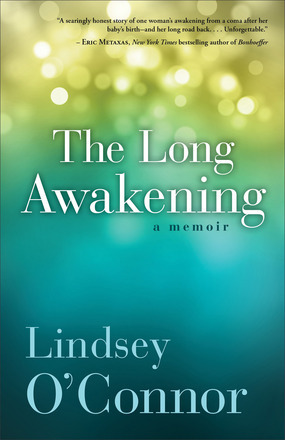 Alana, what a beautifully written review…lyrical…like Lindsey’s book. Yes, I’m glad you waited too. Glad it was worth the wait. And I love, LOVE the picture you posted. Little Violet is, as Cindy says, “pure sugar.” Thanks for tagging me. I love checking in on your posts.